Crisp golden corn chips and our freshly made salsa fresco. A must have! Fresh Avocados mixed with cilantro, onion, tomato, oregano, Serrano chile, and fresh squeezed lime juice. 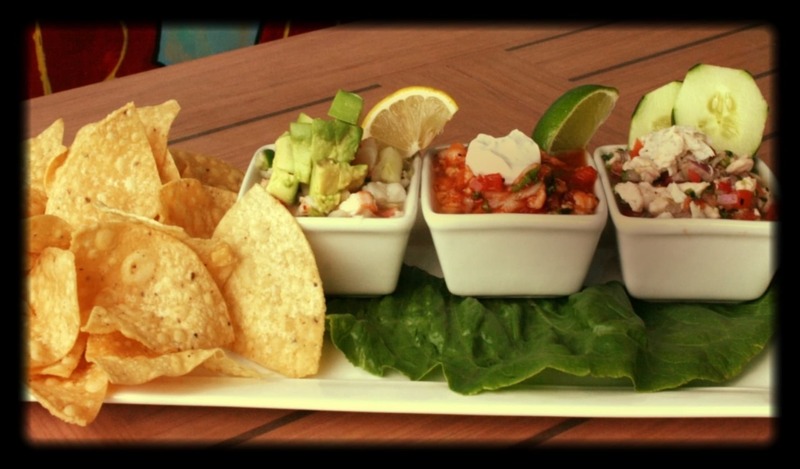 Steamed large prawns in our spicy pico de gallo. Frsh Marinated shrimp in lime juice mixed with tomato, cucumber, onion, serranos, and cilantro. 6 Shrimp wrapped with spicy jalapeo bacon. Topped with chipotle cream sauce and pineapple chutney. 6 freshly picked Pacific oysters from Carlsbad Aquafarm. Seven Shrimp marinated in serrano and jalapeo chillies, lime juice, and red onion. Served cold but filled with extreme heat! A warn plate full of our homemade corn chips covered in melted cheddar and jack cheese topped with ranchero sauce, guacamole, sour cream, tomato, olives, onion, and jalapenos. Served just like our chicken taquitos. Eggplant, zucchini, yellow squash, red onion, tomato, and scallion. Thinly sliced blackened and seared ahi drizzled with mustard vinaigrette, capers, and cilantro. A customer favorite sweet n savory! 7 Shrimp deep fried in our coconut beer batter. Served with fresh fruit salsa and a side of cocktail sauce. A locally harvested oyster livened up with a dash of tapatio, clam juice, ketchup, and cilantro. Served in a shot glass with well tequila or vodka. Tender calamari strips that are first dipped in a light flour breading before being fried. Served with a chilled marinara sauce. Fresh strips of mango, watermelon, pineapple, jicama, and cucumber seasoned with chile powder and lime. Corn tortillas rolled and stuffed with shredded chicken. Fried to a perfectly golden crisp outside and a juicy tender inside. Topped off with ranchero sauce, guacamole, sour cream, tomato, onion, and black olives. Two flour tortillas filled with melted cheddar and jack cheese and non-spicy green chilies. Topped off with ranchero sauce, guacamole, sour cream, tomato, green onion, and black olives. Spicy buffalo style. These go great with Mexican beer! Or try our cove style wings. Crunchy southern style outside with a warm juicy tender inside. Both served with a side of ranch dressing.